Why Your Creative Business Needs Terms and Conditions. As a creative, commissions can arrive in many ways, emails, phone calls, conversations at business meetings, almost any means. It’s very easy to accept the job based on those communications, agreeing a brief, requirements, delivery dates, etc. You think nothing more about it until the time comes to do the job, which you do to the best of your professional abilities, delivering your work to the client as you agreed in those earlier conversations and then finally invoicing the client. How easy is that? Everything has gone without a hitch up to this point, it’s all business as usual. But wait, roll on a couple of months after the invoice was sent to the client and no payment has been received. That’s annoying, a chasing phone call is required with a conversation about when the payment will be made. At this point your expectations of when that should happen can be very different to that of your client. You want it as soon as possible, they want to delay it as long as possible. Chasing money from your clients is perhaps one of the most painful things any business has to do so finding ways to make this as easy as possible is a good thing. Let’s go back to those conversations had before any creative stuff was done, where the talk was about the interesting work every creative loves, the nice bit where you take the picture, film the scene, draw the graphic. The brief was agreed and all the bits that meant the client gets what they want and when they want it. However, was there any conversation about the tedious business-only matters like your payment days? If the answer to that question is no, you’re left wide-open to any number of issues that come about during business-to-client disagreements when there’s no agreement to any such terms before the work started and very unlikely to be any agreement after the work has been delivered. So how could this situation be improved? Have a signed agreement to all the business aspects of your commission before the job is done in the form of a terms and conditions contract, or T&C’s as they are sometimes called. By setting out and contractually agreeing the terms required for you to do business, both parties are legally obligated to the other for the purposes of completing the piece of work. The contract can contain any number of clauses, not just specifying payment days, if it’s important to your business, you can include it in a contract. For instance, as a creative you are probably making new work that has a copyright. Within your contract you can specify that you retain the copyright ownership of that work. You can of course also specify that the copyright passes to the client if that is what is required and the creative agrees. What the contract is doing here is putting all of those boring but very important bits of any business agreement into black and white and which is agreed up front, avoiding any misunderstanding or confusion at a later date. What about specifying how long the client can use the work? Or specifying that the client cannot offer the images to a third party. If you find a client has passed on your work to someone else who is also using them free-of-charge, was there any clause that specifically forbid this and which must have been agreed before the work was passed to the client? If not then it’s a tricky situation to deal with but having that agreement up-front means dealing with that misuse is easier. It’s still awkward to resolve, make no mistake but having a signed contract will be a big help to clear things up. Having a T&C contract means you cover all of the important business-critical points for every commission, none of your important business points are missed because they're right there in the document. Asking a client to sign a contract can highlight issues they're not happy about upfront. When a client isn't happy about some part of the contract, negotiation maybe required before agreement can be reached. An example might be the client wishes to pay in 30 days rather than the days in the contract. It’s up to you if the changes the customer wants to make are acceptable, sometimes a little flexibility is required to keep the client happy, just as long as it’s not at the expense of your business. Look at other similar T&C's to see what they contain to give an idea and for guidence about what you can expect to find. Don't assume these are right though. They could easily have been put together without any legal guidence. Think about what's important for your business. Many clauses will be used every time, payment days for instance, but also consider when you might need to account for things that crop up every now and again, like hiring gear for instance. You may need to account for this in your basic document or only include it when it's relevent to the commission. Don't assume the document is rigid. It can change dependant upon what's required for each job too. 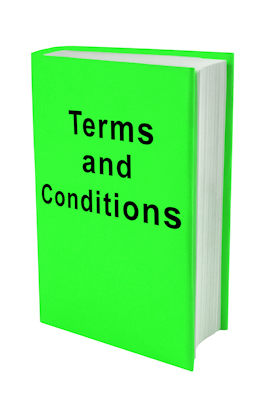 Putting together a terms and conditions document requires some understanding of legal wording and procedures so it’s advised that professional advice is sought to put that document together. It’s very easy to slip up because certain phrases in the T&C’s were used incorrectly meaning a particular clause is invalid or not as effective in protecting your interests as you had hoped. These documents can become part of a legal case when things get messy with a client so ensure the contents are legally correct. Putting the work in up-front to prepare a contract can mean you save yourself much time later when things go wrong. It also sends a strong signal to the client that this business is professionally 'switched-on'. Terms and conditions contracts mean both parties know what's expected of them and clear up any grey areas before any work is done, reducing the risk of misunderstanding at any point during the commission. This can be a huge timesaver for both parties. Disclaimer: All the advice in this article is offered as is and comes with no guarantee or warranty whatsoever. You are strongly advised to seek the services of a legal expert in all contractual matters. We have put together a list of 50 things to consider before you start a new photography business. Also probably applies if you have already started.